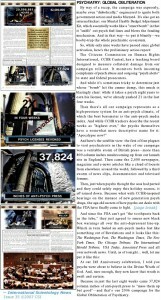 Description: At the 2007 New Year event, David Miscavige reported on Scientology's "diabolically" engineered terror war against psychiatry. Scientologists monitor their cult's progress toward obliterating psychiatry in part by inches of negative press the cultists generate, and also by the number of psychiatrists' licenses they get "yanked." Read this shocking material. This is fully classic David Miscavige as bully and megalomaniacal terrorist with his head way up in the occult. By way of a recap, the campaign was expressly, maybe even “diabolically,” engineered to ignite both government action and media blizzard. It’s also got an internal kicker: our Mental Health Budget Adjustment Kit, which essentially works like a “smart bomb” in that it “sniffs” out psych fuel lines and blows the funding mechanism. And in that way–to put it bluntly–we booby-trap the whole psychiatric ecosystem. So, while only nine weeks have passed since global activation, here’s the preliminary action report: The Citizens Commission on Human Rights International, CCHR Central, has a tracking board designed to measure collateral damage from our campaign roll-out. It monitors both incoming complaints of psych abuse and outgoing “psych alerts” to state and federal prosecutors. And while it’s sometimes tricky to determine just whose “bomb” hit the ammo dump, this much is blazingly clear: while it takes a psych eight years to earn his license, we’ve already yanked 21 in the last four weeks. And here’s the satellite view: the first of four plagues to visit psychiatrists in the wake of our campaign was a veritable storm of British press–more than 800 column inches mushrooming up from our launch site in England. Then came the 2,600 newspaper, magazine and e-news articles like a cloud of locusts from elsewhere around the world, followed by a third swarm of news clips, documentaries and televised forums. Then, just when psychs thought the seas had parted and they could safely enjoy this holiday season, it all rained down. Because what with CCHR-inspired hearings on the menace of new generation psych drugs, the age-old secrets of how psychs cut deals with the FDA have finally come to light. And since the FDA can’t get “the toothpaste back in the tube,” they just agreed to smear new black box warnings all over the anti-depressant line-up. Which in turn fueled an anti-psych media fest like something out of Revelations and it looks like this: The Washington Post, The Washington Times, The New York Times, The Chicago Tribune, The International Herald Tribune, USA Today, Associated Press and all over network news. Until, as of tonight… well, let me put it like this: At our IAS Anniversary celebration, I told you psychs were about to believe in the Divine Wrath of God. And, sure enough, they now know that wrath is swift and certain. 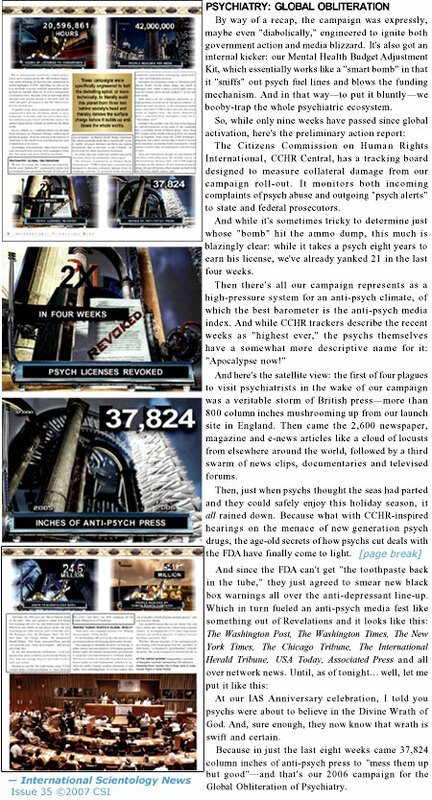 Because in just the last eight weeks came 37,824 column inches of anti-psych press to “mess them up but good”–and that’s our 2006 campaign for the Global Obliteration of Psychiatry. CSI, 2007, Setting the Stage for 2007 Psychiatry: Global Obliteration. International Scientology News, 35, 6-19.